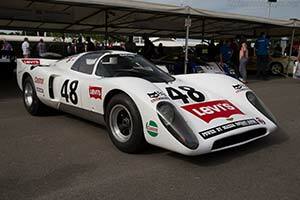 Within a very short time, Chevron emerged as a leading racing car manufacturer. The company founded by the self-taught Derek Bennett had particularly impressed with the B8 sports racer introduced in 1967. Both a success on the racing track and in the sales room, it inspired Bennett to produce a prototype racer for the popular European 2-Litre Championship. Bennett had had the plans for what would become the B16 in his head for quite some time but he could not start working on the new prototype racer until well into the 1969 season. This was mainly because the small company was fully occupied with building customer cars. Another problem Bennett faced was the lack of a suitable 2-litre engine because the BMW 'four' used in the B8 was at the end of its life cycle. What held the tried and trusted BMW 2002 engine back was its single cam, two-valve head. Bennett's initial plan was to have Weslake or Cosworth develop a state of the art head for the BMW engine. Both parties were interested but Weslake required Chevron to bear all the development costs and Cosworth eventually opted to remain loyal to Ford. Instead, Cosworth developed the 'FVC' variant of its 1.6 litre 'FVA' Formula 2 engine, which was effectively one half of the DFV used so successfully in Formula 1. Although displacing only 1760 cc, it was still considerably more powerful than the BMW engine. With the engine issues sorted, Bennett turned his attention to the design and construction of the new chassis. It was effectively a refinement of the existing design and once again consisted of a tubular space-frame, reinforced by steel and duraluminium sheets. The front and rear subframes could be detached to make repairs easier. The suspension also followed conventional lines with double wishbones at the front and reversed lower wishbones, top links and trailing arms at the rear. One of the focus points during development was to keep the car as low as possible and accordingly the car was tightly wrapped in a fibreglass body produced by Specialised Mouldings. Uncertain about his own aerodynamic abilities, Bennett called in the services of Specialised Mouldings' stylist Jim Clark. The end-result was indeed staggering and the coupe's lines impressed all that saw it. It was very quick too, even using the the older BMW engine in testing, it was considerably faster than the B8.